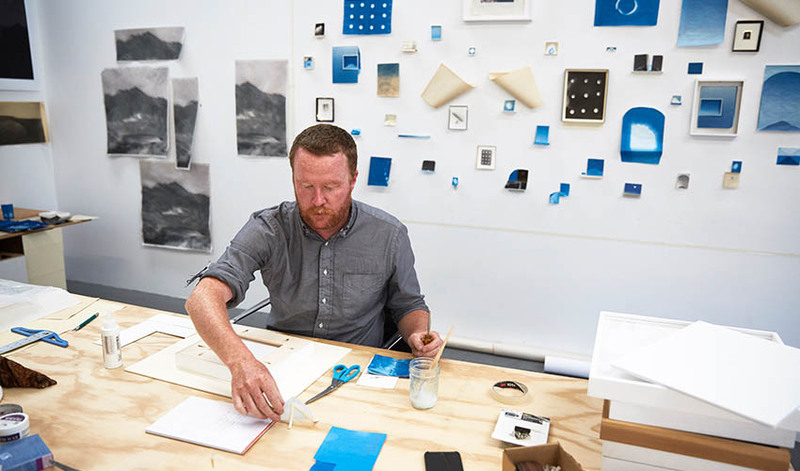 Sean McFarland in his studio at the Minnesota Street Project in San Francisco. Photo by Aaron Wojack. View his lauded work at the Fine Arts Gallery on campus and Casemore/Kirkeby in San Francisco’s Dogpatch neighborhood. During his year teaching in Rochester, New York, Sean McFarland rarely took pictures. He spent more time working with his personal archive of images of the Western landscape. After returning to his beloved San Francisco in 2015, McFarland has again thrived in the Bay Area’s art community, teaching at SF State full time and garnering stellar reviews. Artforum, the world’s premier art magazine, reviewed and recommends McFarland’s solo exhibition at the Casemore/Kirkeby gallery in San Francisco. “Echo” at Casemore/Kirkeby is on display through Oct. 28. Works by McFarland are also featured in the SF State Fine Arts Gallery exhibition “Recollected: Photography from the Archive,” open through Nov. 16. As a winner of the 2017 SECA Art Award, McFarland was also featured in a recent exhibition at the SFMOMA. McFarland, a lecturer in the School of Art, constructs his artwork using found photographs, double exposures, prismatic effects and various light-sensitive materials. He has also incorporated found materials such as bottle caps to create moons and glass to create mountains. Using the suggested immediacy of Polaroids and photography’s claim to veracity, McFarland plays with our notion that when we see something we feel like we are there. He hopes that his work makes people reflect upon nature and the environment. “Normally Polaroid pictures hold ordinary events like birthday parties or family trips,” McFarland says. “When used to represent the sublime in the landscape, our understanding of the medium as this handheld, rapid, intimate and immediate process does something special — we see a rare or impossible view as both accurate and accessible. He cherishes the natural beauty of Mono Lake and the Glass Mountains in the Eastern Sierras as much as the human-made “diorama” of Golden Gate Park. All are some of his favorite places to shoot photographs. McFarland entered Humboldt State University as a computer information sciences major, not discovering photography until his junior year. He completed his bachelor’s degree as a double major, then moved to San Francisco in 2002 to pursue his Master of Fine Arts from California College of the Arts. At SF State, McFarland teaches undergraduate photography courses and interdisciplinary master of fine arts seminars and advises students. He views SF State as the ideal campus for art students and instructors alike.